Many people over the years have asked what made me decide to launch AramcoExPats. The simplest answer is, To promote greater mutual understanding between the Kingdom and people of Saudi Arabia on the one hand and the the people of the world outside the Peninsula on the other hand. Admittedly, that sounds like an idealistic goal, but our newsletter and website are two concrete steps we can take within the range of our abilities and resources to facilitate more effective communication between the Kingdom and the world at large. After almost 14 years of trying, we feel like we're just getting started in achieving our goal. And we've learned that to best achieve that goal, we can use the help of people like you. Since its founding in 2003, AramcoExPats has seen its readership constantly expand, now reaching to many thousands of people in over 200 countries around the world. Given the critical state of world affairs today, and in particular the stresses being placed on the Saudi-U.S. relationship, we at AramcoExPats are hereby committing ourselves to a greater-than-ever effort to improve the bond between the two great countries we have had the honor of calling home. 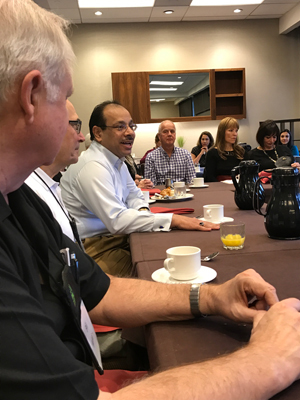 At the recent Monterey Hafla, Mr. Khalid K. Al-Mulhim, General Manager, Government Affairs of Saudi Aramco met with a group of Aramco annuitants to discuss Saudi-U.S. friendship. He pointed out that Saudi Arabia and Saudi Aramco have entered a period of critical transition. He noted that the US and Saudi Arabia have had a mutually-beneficial relationship for many years and asked those of us in attendance our thoughts on ways to support and improve that relationship. In essence, he asked for Aramco annuitants living in the US to become goodwill ambassadors for Saudi Arabia, to act as points of light in a darkening landscape with the goal of bringing the American and Saudi people closer together. Mr. Al-Mulhim's stated goals were to help the people in our nations better understand and repair misconceptions others may have. By working together as members of an extended family, hopefully, we Aramcon can change some of the attitudes and distortions that people in the west now have about the Kingdom. "The Saudi Speakers Bureau takes as its credo this basic formulation: That knowledge begets understanding, that understanding begets respect, and that greater knowledge, better understanding and deeper respect together beget the possibility that the nations and peoples of the world can find ways to live together in peace, develop a true appreciation for one another’s values and beliefs without prejudgment and sustain a lasting mutual tolerance for each other’s aspirations and ways of life. "To lead and support a broad-based, multi-media effort to tell those stories to groups and schools and organizations everywhere. "We pursue these goals believing that knowledge and understanding bring light to the world, drive away the shadow of ignorance and lead us out of the dark land of misunderstanding. Embracing this position, we begin with a look at the long and varied history of Saudi Arabia, a rich, vibrant tale unique among the nations of the world." Today, five years later, these goals are more important than ever. It's time to emphasize again the availability of meaningful information about the KSA on our website that readers in America can put to productive use helping to foster better understanding between the US and Saudi Arabia. Going a step further, we encourage readers in other countries around the world to do what they can to foster better understanding between your countries and Saudi Arabia. The Speakers Bureau contains topical articles on Saudi Arabia designed to serve as lecture scripts and communications tools for people making presentations to outside groups. You might think of them as prepared lesson plans for someone like you who wants to teach others about the Kingdom. For each topic, there is a PDF with full suggested text for a talk, a set of Speaker's Notes, and images for making a slide presentation to accompany the talk. Speakers have the option of using these materials exactly as they are presented on our website, or modifying them to fit the particular needs and circumstances of the talk they are giving. Every week in America, Rotary Clubs, Kiwanis Clubs, Lions Clubs, and other civic groups meet in hundreds of cities across the country, and these clubs are always looking for speakers with interesting stories to tell. Churches, schools, and so many other organizations are likewise constantly on the lookout for speakers with topical subjects to present. We'd like to encourage our readers to join in a renewed effort to foster better understanding of the KSA. Take the time to familiarize yourselves with the content available from the Speakers Bureau. Look around you to see if there's a group in your area that would be interested in learning more about Saudi Arabia. Offer to share your time and knowledge and understanding with others. By doing so, you can play a vital role in improving relations between your country—be it the US or the UK or some other great nation—and the Kingdom of Saudi Arabia. Nobody is better suited for this task than you, a person who has lived and worked in the Kingdom and understands the country and its people based on first-hand experience. Albert Camus once said that misunderstanding kills. As counterpoint, we assert that understanding gives life. Let us all work together to foster better understanding and give new life to the world.